We go on holiday in 4 days 15 hours (not that I’m counting!) so this week is a culinary challenge: feed ourselves decent meals without buying anything new and emptying our fridge by the end of the week. 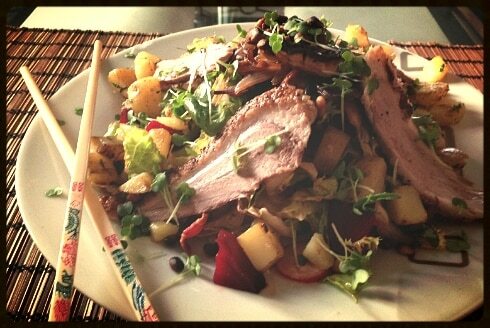 Yesterday I successfully used up a good chunk of ingredients with an Asian inspired duck salad. Aaaaand breathe. I told you I was clearing out the cupboards! Okay. First it’s duck cooking time. Heat the oven to 180 degrees. Score the duck skin and rub with salt, pepper and the five spice. It’ll take around an hour to cook. Once rested cut into thin slices. 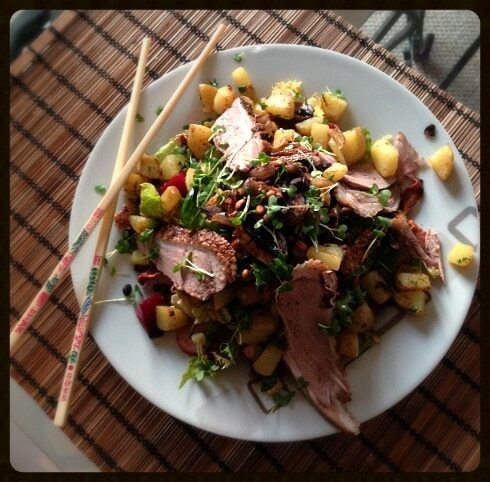 Chop the lettuce into strips, thinly slice the radishes, dice the beetroot and place in a mixing bowl. Slice your potatoes (skin on) into little penny size cubes and put in a salted pot of water to boil for 10 minutes. Cut the onion into long, thin strips. Slice the mushrooms. Add to a hot pan with butter, salt, the minced garlic clove and a good splash of soy sauce. This will need about 5 minutes: soften but do not completely cook through. Put to one side to add to the salad later. Grill on. Cook the bacon until very crispy. Set to one side and once cold, crumble them up into little bacon bits. Back to the potatoes. In the pan you cooked the onion & mushroom in (don’t waste those tasty juices!) add the cubes along with some sesame oil and a liberal sprinkling of salt, on a medium-high heat let them toast and crisp up. 7 minutes should do it. In the last couple of minutes add the chopped parsley. For the dressing, you’ll have to wing it a bit. I used a good squeeze of honey, around one tsp soy sauce, 2 tsp chilli sauce, a splash of sesame oil, splash of olive oil and the grated ginger. Keep tasting it until it’s how you like. Then pour it over the salad in the mixing bowl and toss it up. Pile up the salad leaves and pour everything else on top and around: the mushrooms, the onion, the potatoes. 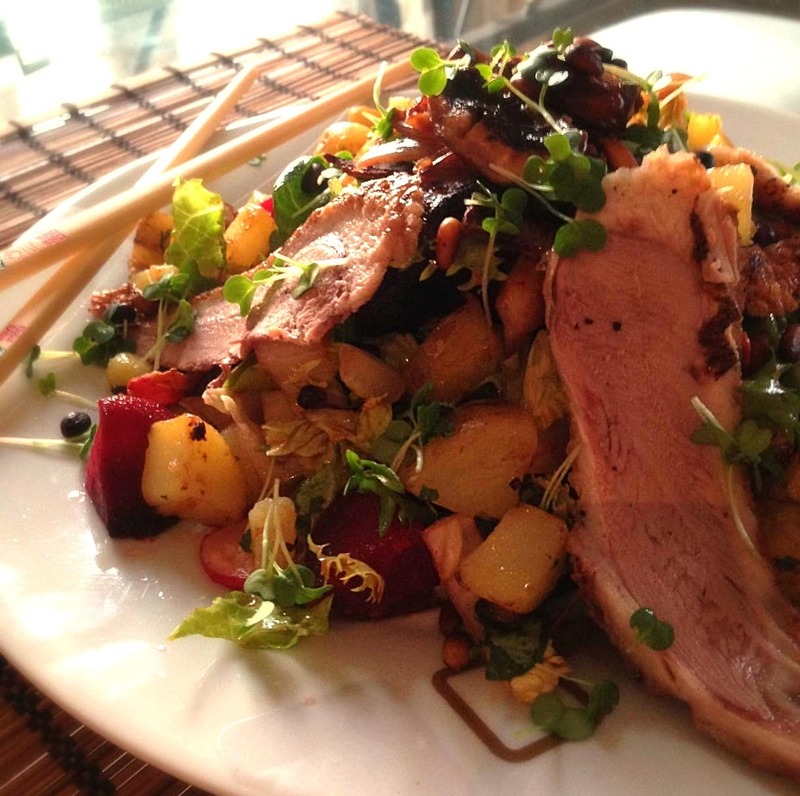 Lay the strips of duck up the sides and finish off with a sprinkling of toasted pine nuts and water cress. Necessity is the mother of invention! 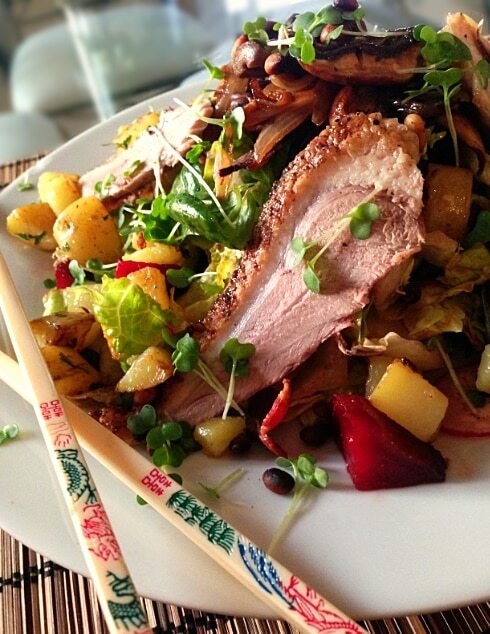 The richness of the duck and the heartiness of the warm potatoes made this a really filling salad. It’s sweet, salty, hot, cold, soft and crispy so every bite is interesting. As an alternative this would be great with strips of steak too! I love duck sooo much. Dammit Jo, you’re making me hungry, this looks amazing. Oh that looks so tasty.